Disney has revealed there will be street entertainment to delight guests when Cars Land opens at Disney California Adventure this summer. 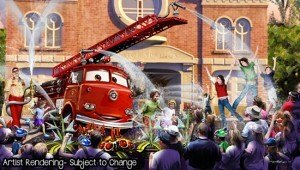 First up is Red the Firetruck, who will arrive at Radiator Springs with a “volunteer firefighter” to help water plants in the area. When things don’t go according to plan, the street show may end up turning the fire hoses on guests. Cars Land will make its official debut June 15.